A view of Sagittarius A*, the supermassive black hole at the center of the Milky Way, taken with the Chandra X-ray Observatory (circled in green). The black hole is visible as a bright spot because it is emitting some of its occasional X-ray flares. Surrounding it are other X-ray sources caused by binary systems with smaller black holes. For decades, astronomers have looked for up to 20,000 black holes that previous research predicted should be concentrated around the Milky Way's core. Sagittarius A* is surrounded by a halo of gas and dust that provides the perfect breeding ground for massive stars, which can then give rise to black holes after they die, said study lead author Chuck Hailey, co-director of the astrophysics lab at Columbia University in New York. In addition, the powerful gravitational pull of Sagittarius A* can pull in black holes from outside this halo, he added. "The Milky Way is really the only galaxy we have where we can study how supermassive black holes interact with little ones because we simply can't see their interactions in other galaxies," Hailey said in a statement. "In a sense, this is the only laboratory we have to study this phenomenon." However, until now, researchers failed to detect such a heavy concentration of black holes, called a "density cusp." "There are only about five dozen known black holes in the entire galaxy — 100,000 light-years wide — and there are supposed to be 10,000 to 20,000 of these things in a region just six light-years wide that no one has been able to find," Hailey said in the statement. "There hasn't been much credible evidence." Black holes absorb anything that falls into them, including light (hence, their name), making them difficult to spot against the dark background of space. Instead, to detect black holes, scientists generally look for ones with nearby companion stars. In such binary systems, the black hole may be tearing apart its partner, giving off radiation in the process. 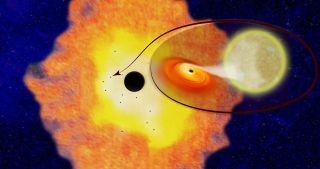 In the past, failed attempts to find the density cusp focused on looking for strong bursts of X-rays that are thought to come from instabilities in so-called "accretion disks" of gas and dust that spiral off from companion stars into black hole partners. However, the galactic center is about 26,000 light-years from Earth, and "black hole binaries only very rarely emit big enough bursts of X-rays to easily see at such a great distance as the galactic center — maybe once every 100 or even 1,000 years," Hailey told Space.com. Instead, Hailey and his colleagues looked for the steadier, less-energetic X-rays given off by accretion disks when the binaries are relatively inactive. Using archival data from NASA's Chandra X-ray Observatory, they detected a dozen such X-ray binaries within about one parsec, or about 3.26 light-years, from the galactic core, findings they detailed in the April 5 issue of the journal Nature. By analyzing the properties and spatial distribution of these X-ray binaries, the researchers extrapolated that 300 to 500 X-ray binaries may lurk in the core of the Milky Way, and about 10,000 isolated black holes without companion stars may also lurk there. "I am really excited to find that there are bunches of black holes in the galactic center," Hailey said. These findings may also "significantly advance gravitational-wave research because knowing the number of black holes in the center of a typical galaxy can help in better predicting how many gravitational-wave events may be associated with them," Hailey said in a statement. "All the information astrophysicists need is at the center of the galaxy." However, the researchers cautioned that making estimates regarding the number of black holes in the galactic core is complicated by the fact that there are likely other sources of X-rays from the center of the galaxy, such as pulsars. Future X-ray observatories may be able to distinguish these different kinds of X-ray sources, Hailey said. "The next generation of X-ray observatories should have very sharp eyes, like Chandra, but also be able to detect much fainter objects at the galactic center," Hailey said.